If you're obsessed with relaxed dressing when it comes to fashion, you'll love this absolutely stylish combo of a charcoal crew-neck t-shirt and an Essentiel mini skirts from yoox.com. Amp up the cool of your getup by wearing silver leather pumps. If you're searching for a casual yet absolutely chic look, choose a beige trenchcoat and an Essentiel mini skirts from yoox.com. As well as very comfy, these two items look wonderful when worn together. If you're scouting for a casual yet seriously chic ensemble, team a black linen trenchcoat with a gold skater skirt. As well as very comfortable, both of these garments look wonderful together. Add a glam twist to your getup with black leather ankle boots. 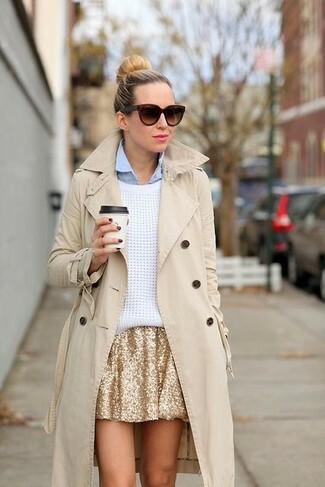 If you're hunting for a casual yet incredibly chic ensemble, consider teaming a black long sleeve blouse with a gold skater skirt. These pieces are totally comfy and look great when paired together. To add oomph to your getup, finish off with black nubuck ankle boots. A black chiffon button down blouse and an Essentiel gold skater skirt are absolute essentials if you're crafting an off-duty wardrobe that holds to the highest style standards. Busy days call for a simple yet stylish outfit, such as a white cable sweater and an Essentiel mini skirts from yoox.com. Throw in a pair of beige leather pumps to instantly up the chic factor of any outfit.